Scotland's greatest World Cup moment came against the Dutch at the 1978 Finals. To guarantee progress from their group, Ally MacLeod's side needed to win by three goals - no easy task. And it got worse when they went 1-0 down after 34 minutes. Kenny Dalglish pulled one back just before half-time and Archie Gemmill put the Scots into the lead. But it was his next goal that will forever be remembered. Gemmill picked up the ball on the right and with his first touch skipped past one defender. He then cut in on goal, beating another man before fooling two more to go in on goal. One-on-one, he was calm enough to take another touch before unleashing the ball past the keeper. It was a goal of top class and one that had Scotland in touching distance of the next round. Unfortunately they conceded a couple of minutes later and their time in the tournament came to an end. It would go down as one of the most memorable moments ever in a World Cup, up there with the ‘Hand of God’ or Roberto Baggio’s blast over the bar in ’94. 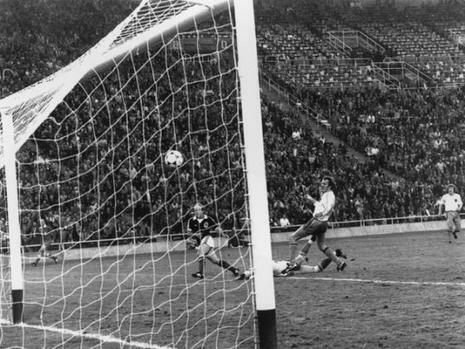 Archie Gemmill’s goal against Holland in the 1978 ranks up there with the best of them.